Note from shop owner Hello there! Thank you for visiting the UD shop. We're working hard on the next step in our journey with Kelly's legacy. Hello there! Thank you for visiting the UD shop. We're working hard on the next step in our journey with Kelly's legacy. There is not a day that goes by that she does not float through my mind in some way. Sometimes getting what you want is bittersweet. It was with tears and shaking hands that I opened this package. Thank you dear, sweat Dove for living on through your beautiful work. Saturnian and Our Lady of Deep Rooted Wisdom will travel with me always. Sometimes getting what you want is bittersweet. It was with tears and shaking hands that I opened this package. Thank you dear, sweet Dove for living on through your beautiful work. Saturnian and Our Lady of Deep Rooted Wisdom will travel with me always. You don't have to be a backcountry babe to be wild; wild is the taste of freedom and truth on the tongue - wherever your feet happen to stand. So my sisters and brethren, speak it your story. Tell me your wild! For my wild heart, my free speakers, my wooded wanderers and mountain-high seekers, my tribe. Yes, you. My tribe. 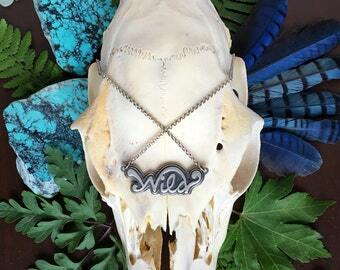 WILD necklace are in the shop and ready to adore your neck! I'm delighted that you've found my humble corner of Etsy! I believe in art. I create because the images I see, both physically and in my mind's eye never let me rest until I've breathed a bit of my own life into them. I paint and smith out of my love and respect for nature, of spiritual matters, of lessons the universe teaches me, of my own experience as a living, breathing, beating, moving, stretching, thinking, feeling, loving woman. I create because it allows me to speak. I create because I believe, with every fiber of my being, that I was placed here on earth to be an artist. And for that, I feel blessed. I appreciate your consideration, your support and your comments. Feel ever free to contact me via Etsy convo. More than anything I want you to be thrilled with your purchase. If for any reason you are not, please contact me within one week of receiving your package and we will work out a solution. After one week, I'll assume that you love it and we can both breathe a big sigh of contentment. I accept PayPal (I know, plain and simple). I kindly ask that payment be sent within three business days of the purchase. If payment does not arrive at that time I will have to (very sadly) relist the item (unless a prior arrangement has been made between us of course). Unless otherwise specified, I ship USPS First Class in the USA (this generally takes 3-4 days). I make every effort to get your packages in post within 48 hours of your payment clearing, but please remember that after that, it's in the hands of your trusty post master! I include insurance and delivery confirmation on all orders over $50. If your order is under $50 and you would like to add on insurance, please send me a convo before sending payment and I will adjust the price accordingly (and of course I can not be held accountable for any orders sent through the post without insurance). I desire to create an environmentally sound business, therefore whenever possible I will use recycled materials to ship your items (ALWAYS with the safety and preservation of your goods as my first priority), so don't be surprised to see boxes on their third and fourth tours of duty! At this time I am unable to take on custom work - my apologies! I spend most of my days singing along in the studio, be it with paint or silver, and I'm always delighted to share my freshest, juiciest work with you! I often preview work on my blog (www.umberdove.com), as well as the UmberDove Facebook page (the very first previews land there! http://www.facebook.com/pages/UmberDove/296068912769). I am happy to reserve work for one week; after which I'll have to release the piece back into the wild world! Thank you from the whole of my heart for your understanding and kindess!